The founder of the 2016-born saxophone quartet Atomos is Arvīds Kazlausks – an extraordinary master of tones and halftones, colours and shades, and lights and shadows, who was nominated as the Musician of the Year for last year’s Latvian Grand Music award. 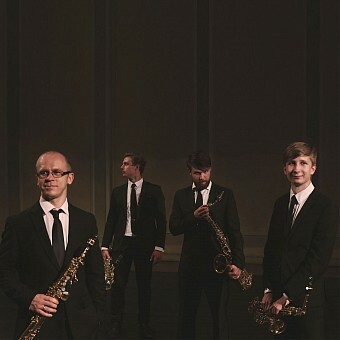 Alongside him the quartet also has a couple of very competent saxophonists of the new generation – Pauls Puķītis and Eduards Lācis, as well as the recipient of the Jāzeps Vītols Latvian Academy of Music and Latvian Mobile Phone Annual award – Aigars Raumanis, who is also a laureate of several international competitions. This programme will see the fantastic four joined by the percussionist with an extensive chamber and orchestral experience Ernests Mediņš. In the concert programme Saxophones in Jazz they are focusing on the great diversity and multiplicity of jazz music… Along with arrangements of bebop grandmasters Dizzy Gillespie and Charles Mingus’s music, and world classics like fragments from George Gershwin’s famous opera Porgy and Bess, notes of modern jazz can also be heard. Interesting rhythmic patterns are heard in the compositions of Dave Brubeck and Mike Mover – the founder of the legendary British sax quartet The Itchy Fingers, while fresh breezes of today’s jazz are revealed in the American composer Rebeca Mauleon’s piece Second Wind and are also felt in the new pieces by well-known young Latvian jazz musicians. Ritvards Garoza, Dāvis Jurka, Chick Corea, Rebeca Mauleón, Charles Mingus, Mike Mower etc.